Fire in the hole! Full details are in for the hit crime drama's second season hitting Blu-ray next month! 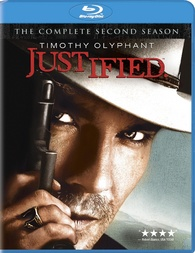 As previously reported, Sony has revealed 'Justified: The Complete Second Season' starring Timothy Olyphant is headed for Blu-ray on January 3. In this season, U.S. Marshal Raylan Givens crosses paths with the Bennet clan, an organized crime family living in the hills of Kentucky led by Mags Bennett (Margo Martindale). The 3-disc set will include all 13 episodes in 1080p with a DTS-HD Master Audio 5.1 soundtrack, and supplements include: On the Set of Justified, Clans, Feuds, & Apple Pie, Outtakes, and a Blu-ray exclusive Talking Shop roundtable discussion featurette. Suggested list price for this set is $49.95. You can find the latest specs for 'Justified: The Complete Second Season' linked from our Blu-ray Release Schedule, where it's indexed under January 3.